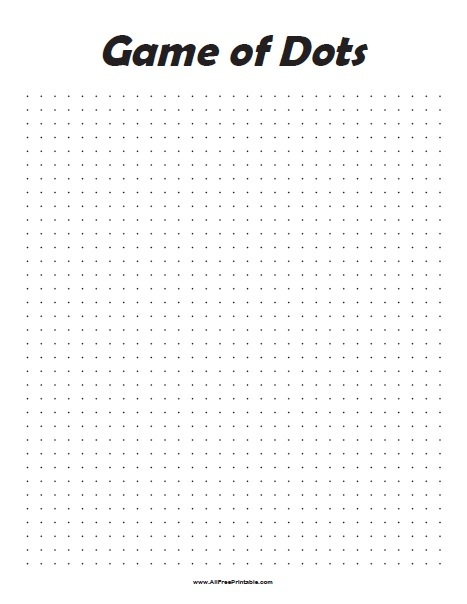 Free Printable Game of Dots. Free Printable Game of Dots, a fun pencil game to share with your family and friends. Save money, you don’t have to spend money on pencil Games, just print them free here and have fun at school, party, or home. Print the game of dots using your inkjet or laser printer. Just draw lines vertical or horizontal to connect the dots and form a box, when you create a box write your name initial. The player with more boxes is the Game of Dots winner. Select from 9×9 dots and boxes game or full page. Click the link below to download or print the Game of Dots now in PDF format for free.